If you’re reading this column, chances are you’re aware that this past Saturday was Free Comic Book Day. 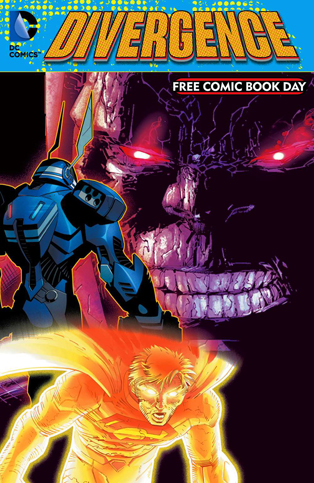 If you’re not familiar, Free Comic Book Day takes place on the first Saturday of May. It’s an annual promotional event sponsored by comic book stores, publishers and their distributor (Diamond). The goal is threefold – bring in new readers, bring back lapsed readers and thank the current readers that keep the business alive. This year set a record with 5.6 million comics ordered by retailers. That’s a 21 percent jump from last year. Every year, Free Comic Book Day seems to get bigger. Heck, it’s hard to believe that this past Saturday was the 14th FCBD. I started my FCBD by going to see Avengers: Age of Ultron and going to my local shop (and Geek Flea sponsor extraordinaire) Paradox Comics in the afternoon. They opened at 10:00 AM to huge line and they still had a line four hours later! They do FCBD right. They have all the books on display behind the counter. The shop has a six book limit to make sure as many people as possible get their free comics. As customers walked up, they’d ask the staff for the books they wanted. It’s an orderly and fair way to do it. While I was there, I saw quite a few patrons perusing the wall for purchases in addition to their free books. Most of the people there seemed genuinely excited. As I strolled up, I asked for my books. I snagged Dark Horse’s Fight Club/Goon/The Strain book, Drawn & Quarterly’s Super Mutant Magic Academy/Step Aside Pops flip book, The Tick, Hip Hop Family Tree: Three In One, All New, All Different Avengers and Divergence. I loved the hell out of all three of them and, to be honest, the quality of the books astounded me. 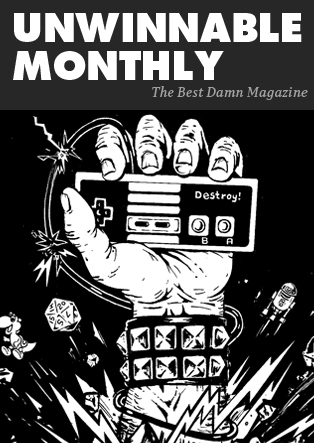 I mean, these are comics by Kate Beaton, Cameron Stewart, Jillian Tamaki, Eric Powell, Scott Snyder, Greg Capullo, Gen Luen Yang, Mark Waid, Ed Piskor, Benito Cereno and so many more incredibly talented comic creators – and they are free! I had a pretty good Free Comic Book Day and so did most everyone I talked to. It’s a helluva representation of where comics are at and where they can go. 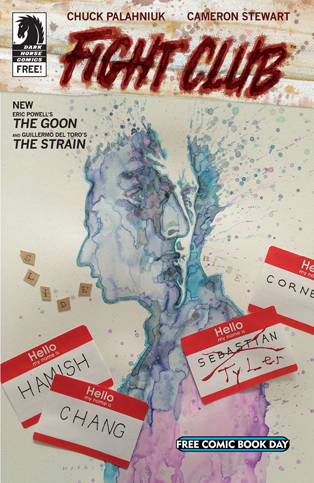 And so, without further ado, here are some of the stalwart Brian Bannen’s FCBD reviews! Divergence is a preview of the status quo changes in the DCU. Following the events of Convergence , it appears that life alters significantly for some of DC’s heaviest hitters. What we’re treated to is a glimpse of the future, and one that is definitely much different, but very intriguing. Scott Snyder pens the tale “Rookie” which takes place after the events of Batman #40. We learn that Batman has been gone for quite some time and in his place, an unexpected ally takes the reins of the Batman. This Batman is unlike anyone we’ve seen before, but one that is also very fitting. I don’t want to spoil it here so I’ll just say that this is a character who associated with the Bat-Family, but definitely not one of them. Snyder is a old hat at writing Batman so even with eight pages, he can still write a solid, character driven story that provides more than enough detail to get readers excited, and enough so that while the major player in Batman has changed, I’m still very excited to see the future. The second story, “Exposed,” is about Superman having his identity revealed by someone very close to him (and you can probably guess who it is). Gen Luen Yang throws in a quick bit of action, but it’s nowhere near as impactful as Clark being confronted by the person who outed him. You can feel Clark’s anger radiating off of him, and I see that someone who readers have become accustomed to is going to quickly turn into public enemy #1. This is only a tease so the reason for the reveal is not yet given, but I’m very curious to see if this was a case of good journalism, or a miscalculation on the part of the revealer. Lastly, Geoff Johns, in his usual Geoff Johns way, teases some major changes for the Justice League in his short “Darkseid War Prologue Two: The Other Amazon.” This is a tense buildup with solid character narration. We see Diana’s birth, then we’re taken to a second, more mysterious birth that occurred on Themyscira at the same time. As any fan of Greek mythology knows, seers are abound in the mythical world and one such seer gives us a glimpse into a very different future, but one with a lot of promise. The teases show some incredible cool changes to the characters – changes that remind me of Blackest Night or Brightest Day, series that altered the role of certain characters to allow them to fill more diverse roles in the DCU. Johns’ story is easily the best of the bunch, compact and engaging, clipping along to its cryptic climax but delivering a myriad of changes in its wake. The best art of the bunch has to be Jason Fabok’s work on Justice League. He peppers the page with lush, gorgeous detail. There’s a neatness to Fabok’s art that gives a beautiful luster to the imagery. The final page – in which Darkseid’s daughter faces the reader while adorned with the different pieces of Justice League’s costumes – is a thing of beauty, and an indicator of Fabok’s rising status as one of DC’s big guns. I’ll admit that I’m skeptical of the major changes DC is pushing through in the wake of Convergence, but this gives me hope. The changes aren’t as drastic as I expected, and they’re definitely intriguing enough to bring new readers in – something that every comic fan wants to see. I’m hoping these changes will usher in some solid storytelling and based on the teases we get, the writers are definitely taking risks, but ones that look like they will pay off in the future. I only hope other changes are as appealing as these. I love The Tick. The series is absurd and hilarious, the work of a talented writer with a penchant for silliness and levity, definitely two much needed traits in a world populated with “serious” comic books. Like Divergence, The Tick is split into three separate stories. All three tales are rife with illogical plotting and overt foolishness, but the heart of the character is still present. Jeff McClelland does his best to capture Ben Edlund’s quirky writing style, but sometimes the work comes across as a weak imitation. Where Edlund found a natural rhythm to his humor, McClelland occasionally tries to force it. There’s a Lost joke that’s been beaten to death and its use pulled me out of the story momentarily because I thought of how creative the comic used to be. Relying instead of a ubiquitous and played-out reference felt cheap. 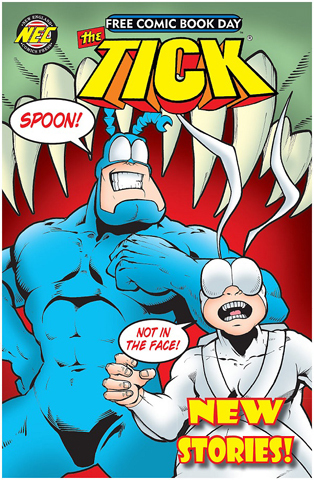 Benito Cereno, however, perfectly captures the wacky world of The Tick. His seven page short is the best thing in the comic. It’s funny and ridiculous, full of the well known foolishness of a Tick comic. We’re merely bystanders in the whole affair, but watching an unconscious Tick wending his way through an unbelievable adventure is so joyful that I couldn’t help but laugh out loud a lot. I’ve never seen a comic that has a Corpse Catcher until now. The Tick is drawn in its classic style and this definitely helps sell the story, particularly when the hero finds himself stuck the front of a bus, upside down, with his forehead being used as a speed inhibitor. The art is everything we’ve come to love about The Tick, and is plays best when Redhead and McClaine put a lot of seriousness into the backgrounds in order to make the comedy even more appealing. The Tick succeeds for the most part, even though it tries a little too hard at times. I can’t really complain about a free comic so I’ll just say that I’ve read some better Tick stories, but even this one is a welcome distraction.